Microsoft has released an early 64-bit version of Office 2016 for the Mac, giving adventurous users a chance to finally make the move off 32-bit, as their Windows colleagues have long done. "The Mac Office team has been working on the transition and we're currently preparing to release the Office apps in full 64-bit," the Office for Mac team announced in an undated post to a company blog. At the same time, Microsoft issued updates to the Office 2016 applications -- Excel, Outlook, PowerPoint and Word -- to users registered with the Insider program, a preview deal that, like the Windows 10 Insider plan, lets Office users grab early builds. All Office 2016 for Mac users, not only those who subscribe to Office 365, may participate in the Insider program. For those who chose the "Insider Fast" release track, the 15.25 update transformed the applications from the standard 32-bit to 64-bit. A glance at the updated Office applications through the macOS System Information pane confirms that they're 64-bit. Although Apple has long urged developers to release 64-bit versions of applications, Microsoft has been a holdout. The Mac's operating system has supported only 64-bit Intel processors since 2011's OS X Lion, although both 32-bit and 64-bit applications may be run on all editions from Lion forward, including this year's macOS Sierra. For most users, the biggest benefit is the ability to work with much larger files -- thanks to the significantly bigger swaths of memory that a 64-bit operating system can access. Excel users, for example, who work with extremely large spreadsheets have been stymied by the 32-bit Office for Mac limitations. 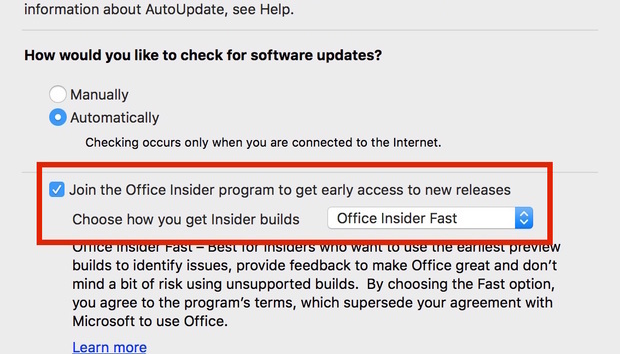 Registering a Mac with the Office Insider program requires a few changes in the Preferences panel of the Microsoft AutoUpdate application, the utility that detects updates, then downloads and installs them. Instructions for signing up as an Insider can be found on Microsoft's website. Microsoft did not reveal a release date for the production-grade 64-bit Office applications.